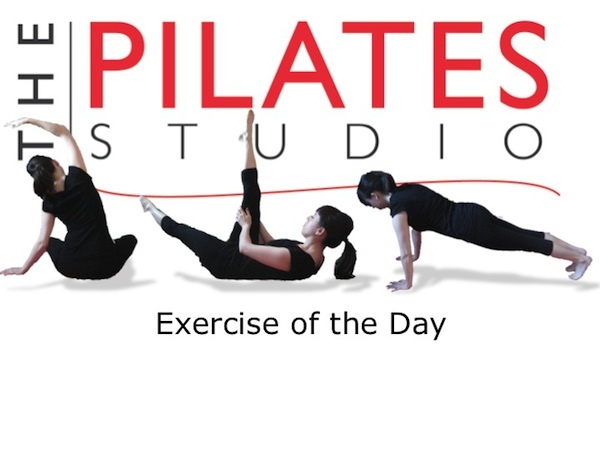 This exercise is intended to give the body an environment to practice moving the legs while keeping the pelvis still. The ball assists the body by holding the legs against gravity so that they can move easily while you learn to use the pelvic floor. 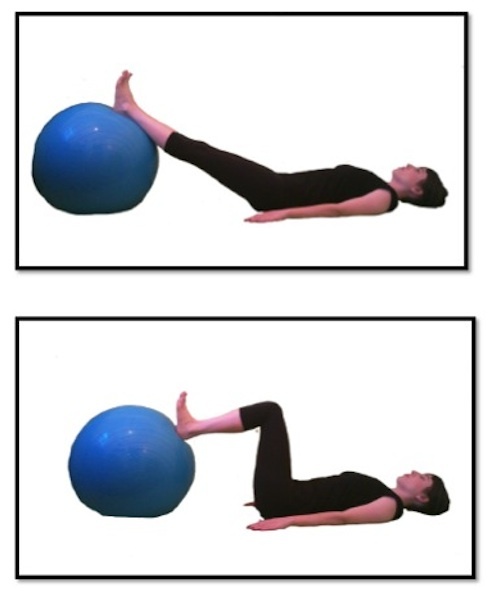 To do this exercise you will need a mat and a large exercise ball (55, 65, or 75cm). Start by lying on your back with your feet propped up on the ball. The back of your calves should be at the top of the ball and your knees will be long. Exhale as you bend your knees pulling the ball towards you, and inhale as you straighten your legs. As you bend your knees notice any movement in your pelvis. Now, exhale and engage your pelvic floor and lower abdominals to keep your pelvis from moving. Repeat this several times. Continuing to exhale as you bend your knees and inhale as you straighten your legs. You can also vary this exercise by simply reversing the breath. To reverse the breath you'll inhale as you bend the knees and exhale as you straighten your legs. Then you can vary the leg position by rotating your legs outward. You heels will be touching on top of the ball, and your toes and your knees will be pointing to the outside. Exhale as you bend your knees and Inhale as you straighten your legs maintaining the external rotation. This exercise can also be done with a single leg on the ball. Place one foot on the ball and reach the other leg up to the ceiling. Exhale as you bend the leg that is on the ball and Inhale as you straighten it. Maintaining stability at the pelvis even though the legs are doing different activities. Thinking about the mirror relationship of the pelvic floor and the thoracic diaphragm will assist you in getting the most benefit out of what by all appearances seems to be an easy exercise. On the inhale the diaphragm (a muscle) engages and as it engages it moves into the abdomen. At the same time the muscles of the pelvic floor release and drop slightly. Then on the exhale the muscles of the pelvic floor engage and lift into the pelvis while the diaphragm releases and moves into the abdomen. The actions of these muscles are what allow the pelvis to stay stabile while the legs move in the hip sockets.